President Obama would be required for the first time to publicly tally the long-term “true costs” – financial and human – of the wars in Afghanistan, Iraq and Libya under a little noticed amendment adopted late last month by the House of Representatives as part of the 2012 National Defense Authorization Act (NDAA). The amendment, offered by Rep. Bruce Braley (D-Iowa), is similar to bipartisan, stand-alone legislation introduced in March by Braley and Rep. Walter Jones (R-North Carolina) as the “True Cost of War Act.” That stand-alone bill has been referred to three House committees, where it could be acted on if the amendment does not survive in the Senate or if the authorization bill is vetoed by the President. The issue is much more than one of accurate bookkeeping. With public opposition to the war solidified at a high level, costs that far exceed what have been made public until now – perhaps by trillions of dollars – could be a major factor in prompting Congress to demand a more rapid drawdown to the war. “As a nation, we have a right to know what these conflicts will actually cost us,” Braley said. The “true costs of war” amendment shines a spotlight on an issue raised by Nobel Prize-winning economist Joseph Stiglitz and Linda Bilmes, professor at Harvard’s Kennedy School of Government, in their 2008 book, The Three Trillion Dollar War. Bilmes in late 2009 and Stiglitz this past May told Nieman Watchdog that, with the escalation of the Afghanistan war and with future medical costs for military veterans and weapons replacement costs running even higher than they had originally estimated, the long-term costs of the Afghanistan and Iraq wars had gone well beyond their original $3 trillion estimate. Braley’s office said his amendment had received some attention in the Iowa press, but not from national mainstream media. A Washington Post blog did make a one-paragraph mention of the amendment. This lack of coverage my have been due to the controversial and newsworthy nature of other provisions in the bill – including a provision that critics said would unconstitutionally expand the President’s war-making authority worldwide – that rightly received attention from the mainstream press. At this point, the future of the legislation and its various amendments is uncertain in the Senate, and President Obama has threatened to veto it if several provisions, including the enhanced presidential war-making powers and restrictions on prosecution of terrorists, are not removed. Braley’s amendment was passed by a voice vote as part of a package of amendments. It would require the President, with input from the Secretary of Defense, the Secretary of State and the Secretary of Veterans Affairs, to submit a written report to Congress within 90 days of the NDAA being signed into law. The report would take into account war costs already incurred and would make estimates of future costs through at least 2020. The estimates would be derived from three scenarios – one in which there would still be 60,000 total troops in Afghanistan and Iraq in 2020, and another projecting 30,000 troops. The third scenario would be determined by the President “based on current contingency and withdrawal plans,” taking into account “expected force levels and the expected length of time” that armed forces members will be deployed in support of those two wars. The wide-ranging amendment would cover not only the regular armed forces, but also reserve components and the costs of equipping and training Iraqi and Afghan forces. It also would require the President to report the “past, current and future costs” of contracts with the ubiquitous contractors and private military security firms that supplement U.S. military operations. The medical costs for veterans will go on for decades after the Afghanistan and Iraq wars end, and the older the veteran, the higher the medical costs. As Bilmes told Nieman Watchdog, medical care costs for veterans of the Vietnam war still haven’t reached their peak, more than three decades after that war ended. For World War II veterans, the biggest total dollar figure for claims paid out to veterans didn’t come until 1996 – more than 50 years after that war ended. 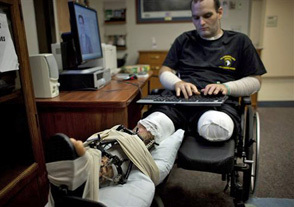 In the ongoing Iraq and Afghanistan wars, the survival rate for wounded soldiers is much higher than in previous wars, which means proportionally greater costs today and in decades to come for disabilities payments and health care than was the case for veterans of previous wars. In Vietnam, for example, for every troop killed there were three wounded. For troops in the current two wars, for which the total death toll now stands at more than 6,000, the ratio is roughly eight wounded in combat for every death, Bilmes said. Stiglitz told Nieman Watchdog in May that one in every two troops returning from these wars requires some physical or psychological medical treatment – many of them for decades to come. This means that the $114 billion cost of the war in Afghanistan for fiscal year 2012 substantially understates the true cost, as healthcare costs for the war’s veterans will continue to increase as each veteran gets older. Braley’s amendment also would require the president to report the “average annual cost for each member of the Armed Forces deployed” in the three wars – “including room and board, equipment and body armor, transportation of troops and equipment (including fuel costs), and operational costs.” The current estimate of the annual cost for one soldier serving in Afghanistan is $1 million. To add to this article, the full cost of the War should also include the many civilian contractors who are home wounded or KIA. Note.2010 had a higher % of civilians contractors KIA than it did Military.The majority of these contractors were also Veteran Military personnel.It makes me very sad to know my son, my only child,24 years old,died protecting a Military convoy and his country does not count his death worthy to be included in our KIA tally and all the other contractors during and to present date in these wars.My country, my government has let me down as well as so many other families..I hope one day to change this.